The first half of May saw no changes in any of the categories of credit card offers, marking the first time in six months that this semi-monthly survey found no changes. To a large extent, this lack of movement in credit card rates is a reflection of recent economic news, which seems to fall into a kind of no-man's-land between negative and positive developments. The general impression is that the economy is slowing a little, but has not slipped back into a recession. As the financial sector waits for the next round of economic data - with inflation and employment being especially relevant - interest rates might well remain stable until a more definitive trend emerges. Specifically, credit card rates might respond to any one of three developments in the broader economy. If growth accelerates, higher demand for credit might push rates higher. However, if the economy slips back into recession, customers with good credit might see lower rates, but customers with weaker credit could see their rates rise, as credit card companies become more cautious about taking on credit risk. Finally, if inflation perks up, credit card companies might raise rates to protect their margins. Regarding inflation, it should be noted that there is currently little room for credit card rates to absorb an acceleration in price increases. According to data from the Federal Reserve and the Bureau of Labor Statistics, the margin of credit card rates over inflation has been below 10 percent throughout the past year. This is not unprecedented, but it is unusually low territory for credit card rates relative to inflation. This is why credit card rates might be more sensitive to any increase in the inflation rate. 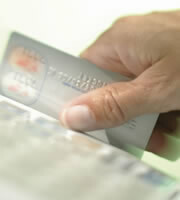 For the time being though, credit card rates have been stable, and that's good for consumers. It creates an environment where consumers can compare credit card rates and choose a card, without being concerned that rapid rate changes will make that decision outdated almost immediately. Both the non-rewards and rewards categories of consumer credit cards remained unchanged in the early part of May, at 15.11 percent and 17.76 percent, respectively. In turn, that stability in credit card rates left the overall category average also unchanged, at 16.97 percent. This marked the first time so far in 2012 that there was no change in at least one of the categories of consumer credit cards from one survey to the next. The average interest rate for student credit cards remained unchanged at 16.98 percent, where it has been for the past two months. Business non-rewards credit card rates were unchanged at 14.74 percent, and business rewards credit cards remained at an average of 15.40 percent. This type of stability has been the rule for business non-rewards credit cards - the category average has yet to change this year. With credit card offers overall remaining unchanged in the first half of May, the relationship between rates for customers with excellent credit and those for customers with average credit remained unchanged. This is another aspect of the credit card rate environment that might be sensitive to a change in economic trends. A deteriorating economy is likely to widen that spread in rates, making credit relatively more expensive for customers with weaker credit ratings. On the other hand, an improving economy could cause that spread in rates to tighten. 0 Responses to "Stability rules for credit cards"